Santa Monica Airport Forum: 4-27-13 - Yo! Venice! 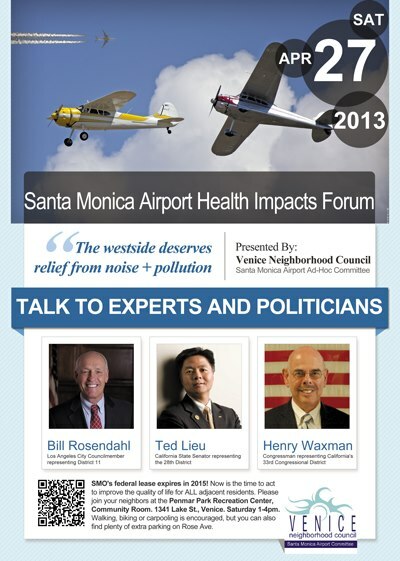 The Venice Neighborhood Council and the Mar Vista Community Council will hold a joint forum on the effects of the Santa Monica Airport (SMO) on Los Angeles residents. The forum will be held Saturday, April 27, 2013, from 1:00-4:00 p.m. at Penmar Park Recreation Center, Community Room, 1341 Lake St., Venice. Expert speakers will be featured from various specialties and government agencies. Topics for discussion will include the effects from SMO on health and safety, including research findings on pollution from lead, noise, and fine particulates. Los Angeles, State and Federal political representatives have been invited to speak about their position regarding this airport. The community will participate in a Q&A to voice areas of concern and suggest solutions. The Santa Monica Airport Committee of the Venice Neighborhood Council has studied the issue for over three years, and will present a summary of our findings. The Los Angeles City Council, Senator Ted Lieu, Rep. Henry Waxman, FAA officials, and the Los Angeles Mayoral candidates are invited to speak about the effects of SMO on the community. Parking: Stakeholders are encouraged to walk or carpool. Parking is available at two parking lots on Lake Street, with additional surrounding street parking.